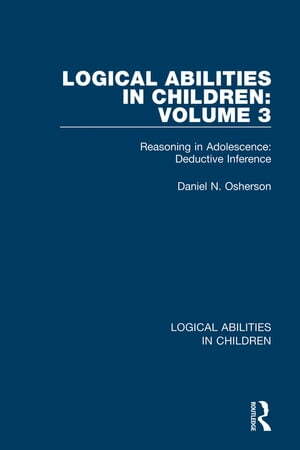 Collins Booksellers - Logical Abilities in Children: Volume 3 by Daniel N. Osherson, 9781351616041. Buy this book online. Originally published in 1975, this volume (3 of 4) presents an expanded model of certain deductive abilities in children and adults. A partial explanation of the growth of these abilities was suggested in Volume 2 of this series, and it is amplified here, both with regard to propositional logic and the logic of class inclusion. A new methodology is employed, the issue of the effect of content in deductive reasoning is covered, and developmental questions are reformulated. Although only data from experiments with adolescents are presented here, the volume sets the stage for potentially illustrating developmental comparisons, a topic pursued in Volume 4 of this novel and inventive series.